Go to almost any Mexican food restaurant and you’ll be greeted with a basket of chips. The chips are often accompanied by bowls of salsa and cheese dip. Chances are, if you eat a steady stream of chips dipped in cheese until the meal comes, you’ll have consumed more calories than are in your dinner. 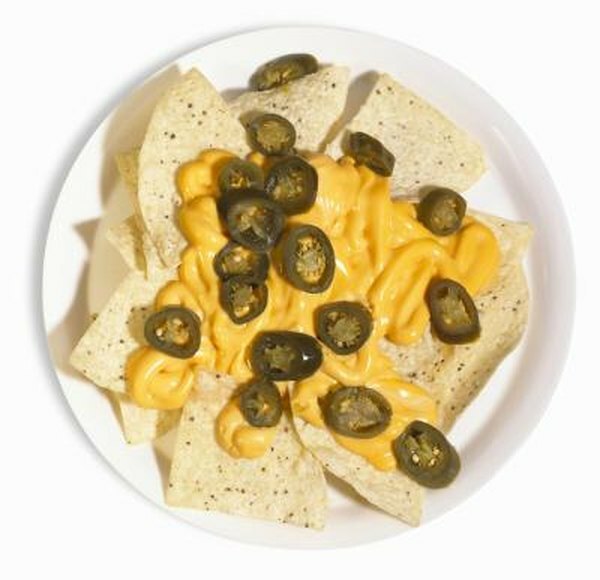 Chips and cheese can put the brakes on a healthy diet, unless consumed in moderation. The chips most often served with cheese are tortilla chips. These are made from corn tortillas, and are usually pale or dark yellow in color. Some restaurants dye their chips red and green, and on rare occasions you may be served blue corn chips, which are made from blue corn. the type of corn has little to no impact on the nutritional values of the tortilla chips, however. The cheese that accompanies the chips is often cheese in name only. It is often a mixture of whey solids, oils and artificial coloring and flavoring. Actual cheese is often a small part of the recipe. The cheese that accompanies chips is pourable when hot, so that people can use it as a dip. It may contain bits of jalapeno peppers and tomatoes. One oz. of tortilla chips contains 140 calories, according to the USDA’s Nutrient Data Laboratory. Of course, many people eat much more than 1 oz. of tortilla chips when waiting for a meal. Three ounces of tortilla chips contain a whopping 420 calories. A 3 oz. serving of cheese contains approximately 174 calories. While the calories in tortilla chips are likely to be similar from restaurant to restaurant, the calories in the side order of cheese will vary depending on the ingredients used to make it. If you purchase your chips and cheese from a drive-through, a 1 oz. serving of chips topped with cheese will cost you almost 300 calories. An ounce of tortilla chips contains 19 g of carbohydrates, 2 g of protein and 6 g of fat. You’ll also get a little over 1 g of fiber. A 3 oz. serving of cheese dip contains 5 g of carbohydrates, 9 g of protein and 13 g of fat – over 8 g of which is saturated. Keep in mind that no more than 10 percent of your fat intake should come from saturated fat, according to the USDA’s Dietary Guidelines for Americans. Chips and cheese are not a nutrient-dense food. The combination would be healthier if the cheese served with chips were actual cheese, however, this is not often the case. When you eat chips and cheese, you’ll get small amounts of iron, calcium and magnesium in addition to trace amount of many other nutrients. Be aware of the sodium you are consuming, as 1 oz. of tortilla chips contains 80 mg of sodium and 3 oz. of cheese dip contains more than 300 mg of sodium. You can make your own cheese dip at home using low-fat versions of pasteurized cheese product and cream cheese. You can add non-fat milk and a can of tomatoes. While this cheese will not be low in calories, it will have fewer of them and will contain less fat. You can also buy fat-free corn tortilla chips or make them yourself by baking fat-free tortillas that have been cut into sixths. If you are at a restaurant, place 10 of the chips on a plate. This is approximately 100 calories worth, and you’ll be able to keep track of how many you’re consuming. Dip your chips in salsa, as it is very low in calories and is a healthy food.